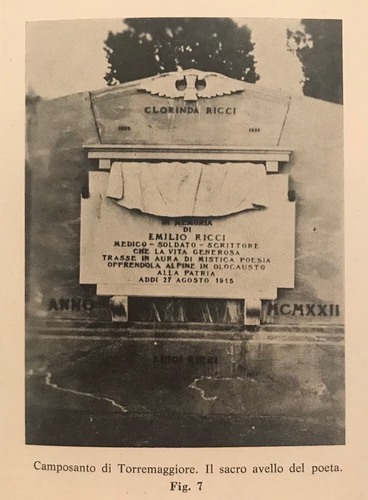 The graves of Emilio Ricci, his father Luigi and his sister Clorinda, are located in Torremaggiore's cemetery. His corpse was transferred from Doberdò del Lago (Friuli-Venezia-Giulia) where he died, to Torremaggiore in 1922, where he was welcomed by a huge audience1. 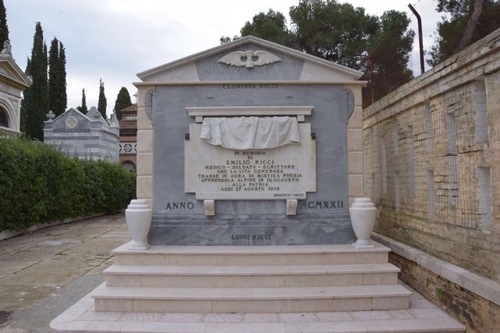 In 2017 his tomb was rebuilt and Emilio Ricci and his relatives' corpses were moved to the entrance of Torremaggiore's cemetery in this new tomb. The ancient tomb was composed of three lobes which look like a single marble block with a sign, sourmounted by a draped sculpture depicting the National Flag3. 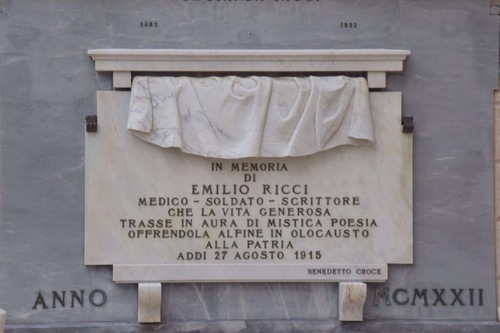 "IN MEMORIA / DI / EMILIO RICCI / MEDICO, SOLDATO, SCRITTORE / CHE LA VITA GENEROSA / TRASSE IN AURA DI MISTICA POESIA / OFFRENDOLA ALFINE IN OLOCAUSTO / ALLA PATRIA / ADDI' 27 AGOSTO 1915"